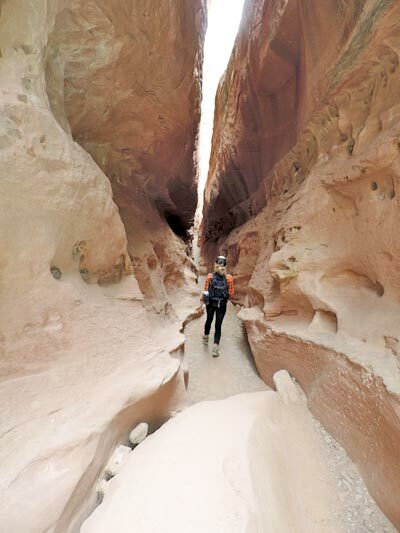 This beautiful 8-mile hike winds through some of Utah’s best (and most popular) slot canyons: Little Wild Horse and Bell Canyons. We left our BLM campsite (located up a 4×4 access wash!) and started at the trailhead at about 8am. We began the hike with other groups of people hiking along near by. When we reached the “Y” we headed up Bell Canyon to ditch the crowds as most people hike this loop up Little Wild Horse, then down Bell. With eerie quietness, we groped along the narrow walls and scrabbled up and over boulders lodged between the walls. The faint call of Canyon Wren could be heard admits the steps of our feet atop the sand and river stone. The trail opened up as we exited Bell Canyon and traversed an old jeep trail for a mile or so; the jeep trail connected us to a wide wash, which eventually funneled into Little Wild Horse Canyon. 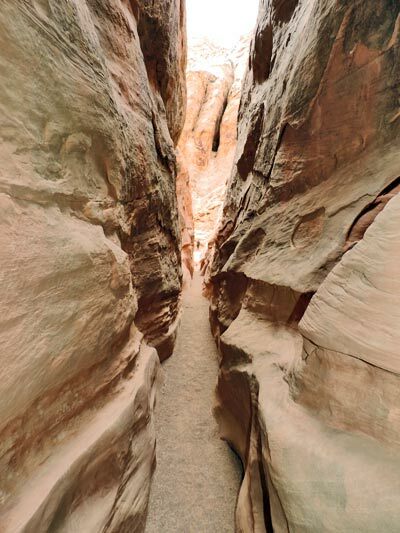 The canyon dropped fast as we looked for creative ways to climb over and under giant boulders of red sand stone. Prince plumes and prim roses scattered the walls resembling hanging gardens. The final few miles were the most breath taking. The curvature of the walls spinning up into the sky were inspiring, as if an architect had formed these for a modern art show. We completed the loop in 4.5 hours at a pretty fast pace stopping for lunch and short exploration. Experience: With 8 years of experience in the Montrose real estate business and 49 successful closings in 2013, you can be confident that Diana’s knowledge and expertise of the market will serve you well. Her advisory chair position on the Montrose Board of Realtors also adds an edge to the expertise you deserve. Expertise: Extensive experience working with first-time home buyers, investors, foreclosure markets, and higher-end properties. Diana’s average list-to-sold period in 2013 was 3.5 months; proof that her expertise and 10-step marketing plan works. Diana was designated “Realtor of the Year” in 2013 for her outstanding ethics and service. Reblogged this on Post Adventure.